This post is more for me than it is for you. Two weeks ago, I participated in a pandemic simulation that I had studied for more than month for, only to use none of the information I learned! It was a pretty painful experience that taught me some deep lessons about how not to plan too much and not to hold my assumptions too strongly. Nonetheless, in spite of missing the opportunity to exercise that knowledge I developed there I will instead do it here. Otherwise my head will explode. Surprisingly, there some principles and pieces of information about epidemics and infectious outbreaks that can be applied to today’s world. They reinforce the importance of being conscious of and concerned for natural ecosystems and can be extrapolated to make the case for a vegan life. Before I begin, just some terms and definitions. The two fundamental terms to keep in mind are epidemic and pandemic. 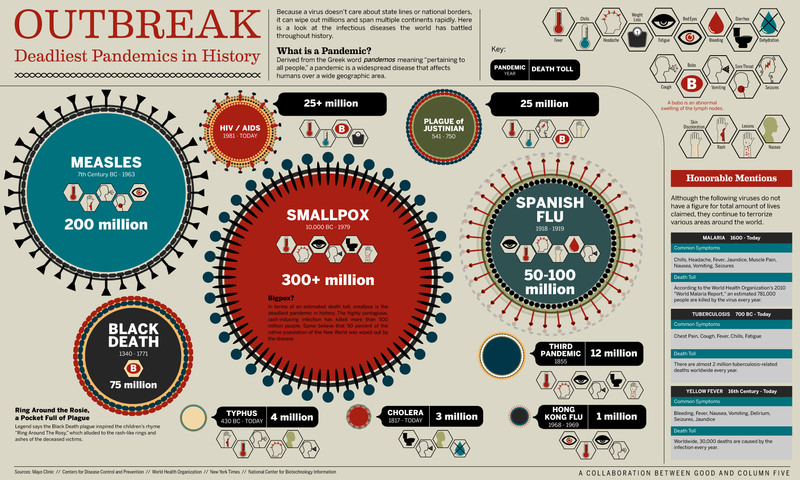 Epidemics – which are what I will be discussing in this post – are large outbreaks of disease; pandemics are epidemics that span over geographic territories (they are also what I wasted more than a month studying). Pathogen is a word I’ll be using a lot too, they’re viruses or bacteria that cause a disease. Virulence is how much a pathogen makes you sick. Contagiousness is how well a pathogen transmits from host to host. Novel, for those who may not know, refers to something that is new and unique (honestly, that definition confused me for a little while). Novel pathogens are more virulent and contagious than native ones. And lastly, zoonotic pathogens are those that are spread from animals to humans. The first piece of information that I noticed was that scholars and thinkers agree that humanity is at higher risk for an outbreak now than in the past. People have even argued that we may be entering a post-antibiotic world, which is extremely significant. It has been argued that while the science of studying, identifying, and fighting pathogens improves, the rate at which they can mutate and adapt in harmful ways is outpacing the science. This is because the conditions in which outbreaks occur are growing and pathogens are becoming stronger and more resistant to the ways we’ve been fighting them. Viruses can mutate and become unimpeded by vaccines and antiviral drugs, just as bacteria can adapt and become drug resistant. When this occurs, they become more virulent and contagious. Arguably, one of the most serious examples of this is the overuse of antibiotics on animals used for meat, which is one of those problems most people seem to know about and almost everyone does nothing about. This phenomenon poses a serious risk to us because such overuse exponentially increases the likelihood that bacteria adapt resistance and when we consume that meat, we ingest those antibiotic resistant bacteria which puts us at greater risk for infection (more on this later). The second piece of information is that there is a great need for conducting animal research to discern the features of a pathogen, how it spreads, and what the implications mean for us. This was a concern that was emphasized in many articles I read. Scientists would be able to learn about the pathology of a virus or bacteria, its genome and anatomy, and other facts about the role animals play in pathogenic evolution and transmission. Another aspect of animal experimentation in the realm of epidemic preparedness is that it’s required as part of the Clinical Phases of developing medicine. However, both types of research represent a serious ethical dilemma that necessitates rules, boundaries, standards, methods and designs, and data collection to ensure its integrity and reduction of unjustifiable harm. Therefore, it is imperative to have a fact-based, ethically conscious discussion about whether there is a need for animal experimentation as a means of learning more about pathogens, their biology, and their associated risks in today’s world. This is an area where vegan perspectives can be helpful and productive. The first principle I recognized is that societal development comes with certain risks, but particular to infectious spread is the risk of what is called spillover, i.e. when a pathogen spreads from one organism to another. This is a concern because as we expand communities into more area, we make contact with new animals and bacteria that could infect us with diseases we haven’t dealt with before: they’re novel pathogens. A recent article explored the phenomenon of zoonosis, which is an area that has a large degree of novel zoonotic pathogens in it. The authors theorized that these areas are posing a greater threat to us as we expand into new land and interact with animals through multiple industrial and cultural practices. They argued that research needs to be done to more accurately predict and prepare for infectious spread. It’s also crucial to understand zoonotic risk because it is an inherent side effect of people moving into new places and interacting with animals the way they do, like hunting or slaughtering, containing them all together, “cleaning”, handling, consuming the meat, etc. In fact, these two issues permeate through the issue of epidemic risk and preparedness. A broader problem relating to expansion is the myriad of risks associated with globalization and urbanization; this is the second principle I identified. A side effect of globalization is increased international travel, which means people from one country, with immune systems adapted for their geographic region, go to another country with novel pathogens that are more virulent. Those pathogens travel back with the unsuspecting hosts when they return home and spread in a new region. This has been seen with the Zika virus, MERS-CoV, and H5N2 avian influenza. Regarding urbanization, the risk comes from the closeness of everyone, which can increase the contagiousness of a pathogen. Ultimately though, globalization and urbanization are positive and, frankly, uncontrollable and unstoppable, so we must think about the epidemiological implications in order to mitigate harm. The third principle was that wild, domestic, and farm animals possess many pathogens that pose a constant risk of spilling-over into humans. In fact, most of the pathogens that infect humans are zoonotic. As if that’s not bad enough, those pathogens can travel from animal to animal or animal to human, adapting and becoming stronger with each transmission, even circulating between multiple animal species before coming back to infect humans. The way we interact with animals in society through hunting or slaughtering, containing them all together, “cleaning”, handling, consuming the meat. etc. is also a serious problem. Spillovers related to the use of animals is reported for overwhelming epidemics such as AIDS, SARS, and Salmonella Heidelberg. (This is where we can extrapolate an argument for veganism) It is reasonable to conclude that there is an empirical risk associated with those practices, and that a responsible and smart decision would be to not engage in behaviors that expose you to those risks. It’s also reasonable that being vegan would be a prudent, easy, ethical, and all-around positive choice to not engage in those behaviors. Now of course, there is also risk associated with plants and bacterial agents, but my slightly educated hunch is that that risk is much lower. In fact, there was no concern about plant-based bacterial outbreaks mentioned in any of the research I read into. Phew, all that information can be pretty nerve-racking and dispiriting, so I will end with some points that should bring calm. A very important principle about pathogens is that of the thousands known by scientists, there are only a small number that have a likelihood of infecting humans and even fewer that lead to outbreaks. Furthermore, vaccines, antiviral drugs, antibiotics, and phage therapies all effectively fight against most of the pathogens that do infect humans. Think about how many diseases that have been eliminated outright or controlled so much that they don’t impact society – that is an instantiation of the efficacy of public health emergency preparedness. We just have to hope that the politics and public policy stay focused and responsible in protecting everyone. No big deal, what can go wrong?